Oxford Instruments and Zurich Instruments announce a technical collaboration for low temperature physics. The collaboration will yield a series of joint application notes featuring low temperature measurement techniques and applications. Oxford Instruments, market leader in cryogenic equipment, and Zurich Instruments, the technical leader for digital lock-in amplifiers, announce their joint technical collaboration primarily focused on demonstrating how the efficiency of combining equipment from both companies results in reduced time between installation and measurement. The two companies will also exchange technical expertise in order to improve their customer support for the low temperature community. Both companies are devoted to the objective of managing the increasing complexity and costs of low temperature research. “This collaboration continues to demonstrate the versatility of Oxford Instruments’ OptistatDry Cryofree cryostat for optical and electrical applications. 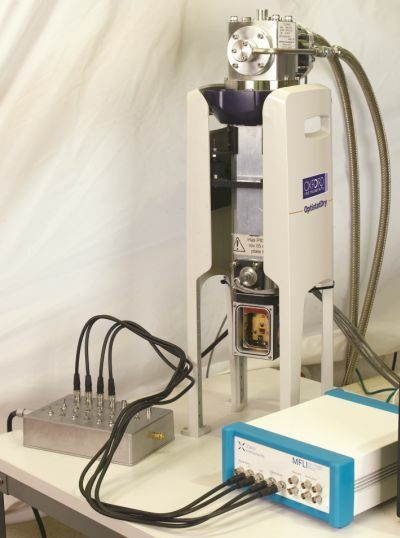 Our customers' demands for streamlined experiments and the joint demonstrations with ZI equipment provide the evidence for faster and more accurate measurements taken in less time,” said Dr Michael Cuthbert, Managing Director at Oxford Instruments Nanoscience. The OptistatDry comprises a range of compact cryostats with outstanding optical access, fast set-up and fast sample change, cooled by a closed cycle refrigerator. “Our lock-in amplifiers are designed for efficient and effective measurements. The high-end features and usability that we have developed for our instruments are now, with the MFLI Lock-in Amplifier, available for low and medium frequencies”, said Sadik Hafizovic, CEO of Zurich Instruments. Covering the frequency range between DC and 500 kHz or, alternatively, up to 5 MHz, the MFLI ideally targets low temperature communities providing signal generation and measurement analysis all within its LabOne software environment, resulting in an improved understanding of the signal quality during the course of their measurements. The first application note resulting from this collaboration has already been released. The publication relates to the characterization of a high temperature superconducting sample using the MFLI Lock-in Amplifier and the OptistatDry cryostat. Oxford Instruments NanoScience designs, supplies and supports market-leading research tools that enable quantum technologies, new materials and device development in the physical sciences. Our tools support research down to the atomic scale through creation of high performance, cryogen free low temperature and magnetic environments, based upon our core technologies in low and ultra-low temperatures, high magnetic fields and system integration, with ever-increasing levels of experimental and measurement readiness. Oxford Instruments NanoScience is a part of the Oxford Instruments plc group. Zurich Instruments makes lock-in amplifiers, phase-locked loops, and impedance spectroscopes that have revolutionized instrumentation in the medium-frequency (MF) up to the ultra-high-frequency (UHF) ranges by combining frequency-domain tools and time-domain tools within each product. This reduces the complexity of laboratory setups, removes sources of problems and provides new measurement approaches that support the progress of research.